When Kate, single mother and law firm partner, gets an urgent phone call from her daughter’s exclusive private school summoning her to, she’s shocked. Amelia has been suspended for cheating. It’s completely out of character for her over-achieving, well-behaved daughter to do something like this. Frantic, Kate finally arrives at Grace Hall, but what she finds is beyond comprehension. The moment she sees that message, Kate knows in her heart it’s true. Clearly Amelia had secrets, and a life Kate knew nothing about. Wracked by guilt, Kate is determined to find out what those secrets were and who could have hated her daughter enough to kill. She searches through Amelia’s emails, texts, and Facebook updates, piecing together the last troubled days of her daughter’s life. 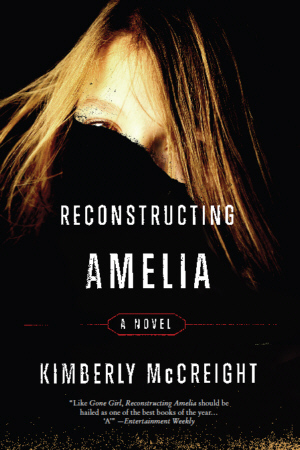 Reconstructing Amelia a stunning debut page-turner that brilliantly explores the secret world of teenagers, their clandestine first loves, hidden friendships, and the dangerous cruelty that can spill over into acts of terrible betrayal. “In this heart-wrenching story of secrets and betrayal, Amelia’s mother, Kate, is taken places no parent should ever have to go as she tries to piece together the truth about her daughter’s tragic death. McCreight captures the complexities, cruelty and angst of teenage girls so well my stomach was in knots. What really happened to Amelia? You’ll find yourself staying up all night to find out. Kimberly McCreight has written a gripping mystery that moves as swift as a luge ride under its heavy topical weight. Tackling the thorny issue of school bullying head-on, Reconstructing Amelia entertains even as it explores the hardest kind of death to accept — the death of a child.